Heat berries with Agave nectar or sugar until warmed and slightly boiling. Alternately you can use them fresh and raw. Add a half teaspoon of corn starch to thicken. You can also add the liquor here while cooking the fruit to burn off the alcohol or wait until you build the layers to sprinkle it on the pound cake! Whip cream to peaks and set a small portion of the whipped cream aside in a separate bowl. Add sugar and vanilla to taste. Again, you can also add a bit of the liquor to the cream! Whip the jar of lemon curd into the separate bowl of whipped cream. Fold the lemon curd-whip cream mixture into the entire batch of whipped cream. Do not mix well. Swirls are a good thing! In a trifle dish, layer the pound cake /lady fingers, on the bottom and sprinkle the liquor on the cake layer. 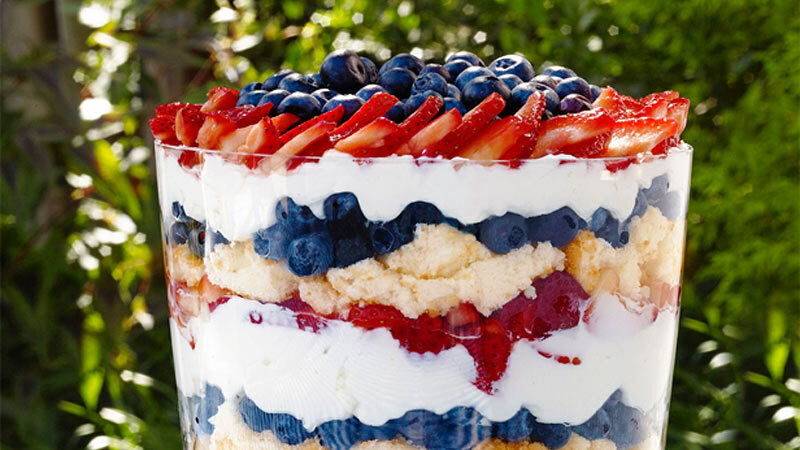 Next put a layer of berries and then the whipped cream mixture. Repeat layers until the dish is full. Put in refrigerator for 4 hours to allow the flavors to coalesce. This recipe also works with lots of other types of fruits or even espresso and and chocolate! Enjoy!